Considering that no foreign military intervention will take place in Syria, three different scenarios can be looked at to appease the Syrian conflict that erupted almost a year ago. The decision should be taken by an unanimous agreement from the world’s big powers; and will be planned and conducted by local Syrian forces. This will be executed after a pre-plan is set to pass the power after the death of the Syrian president and will be adopted by an unknown organization such as “Syrian Free Fighters”. Such act of war is the last bullet used by the US and European countries to get rid of a problem; such examples occurred on the failed assassination attempts of Hitler and Noriega. This is more likely to happen when your opponent is still in control of the country and has heavy military power. The world powers tend to reach to a “costly” agreement with the president Assaad in return of denying his mass killings, stop supporting the opposition and appease the riots. 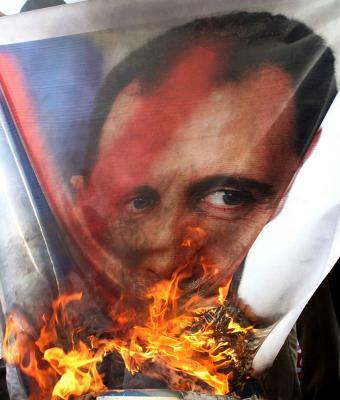 Why this will be costly to Assad? Because he will have to give compensations and contracts, especially helping the US in Iraq, accepting oil and economical agreements; and most importantly immediate cessation in supporting and supplying Hezbollah. In two words, Civil War. That can lead Syria to total internal destruction in a way to remove any leftovers of Assad regime; a war that can be compared to the Bosnian conflict or the Lebanese war; where different armed militias will divide the country. Whatever is the scenario, the world should not only focus on Bachar El-Assad as a person but rather think about the after Bachar El-Assad.